3 Warming up questions: 1. Have you visited a fruit farm? 2. 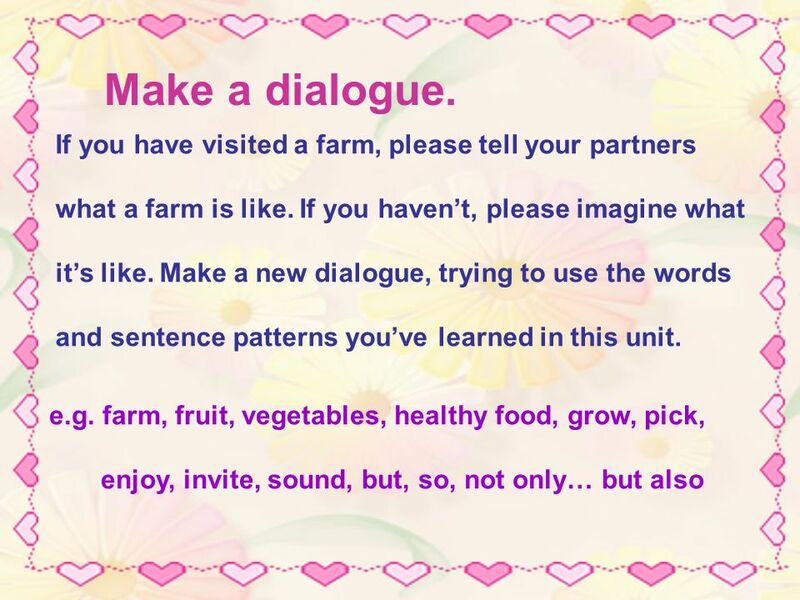 What does a farmer grow on a fruit farm? He grows andfruit vegetables. 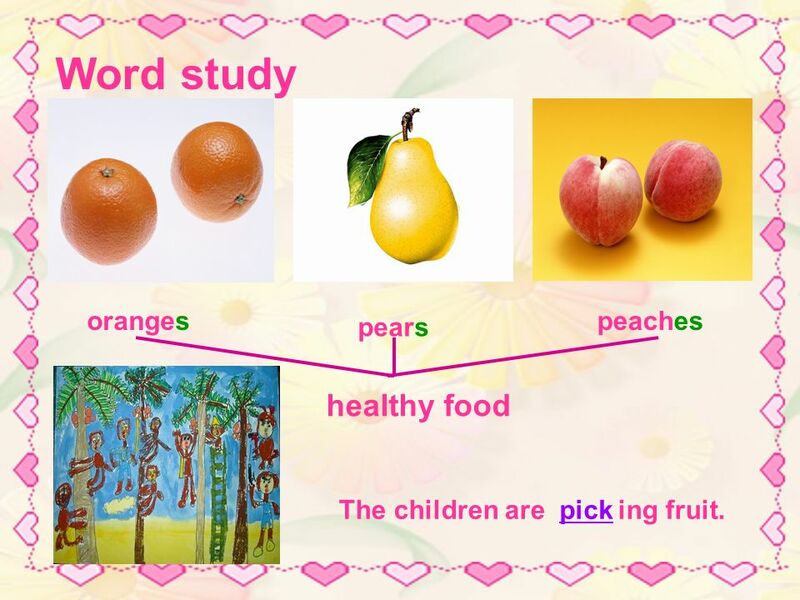 4 Word study oranges pears peaches healthy food pickThe children are ing fruit. 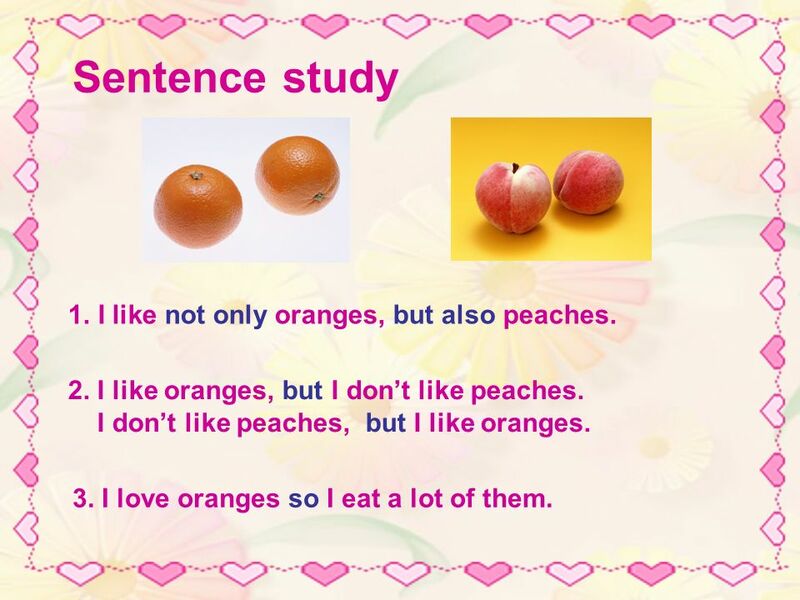 6 Sentence study 1. I like not only oranges, but also peaches. 2. I like oranges, but I dont like peaches. I dont like peaches, but I like oranges. 3. I love oranges so I eat a lot of them. 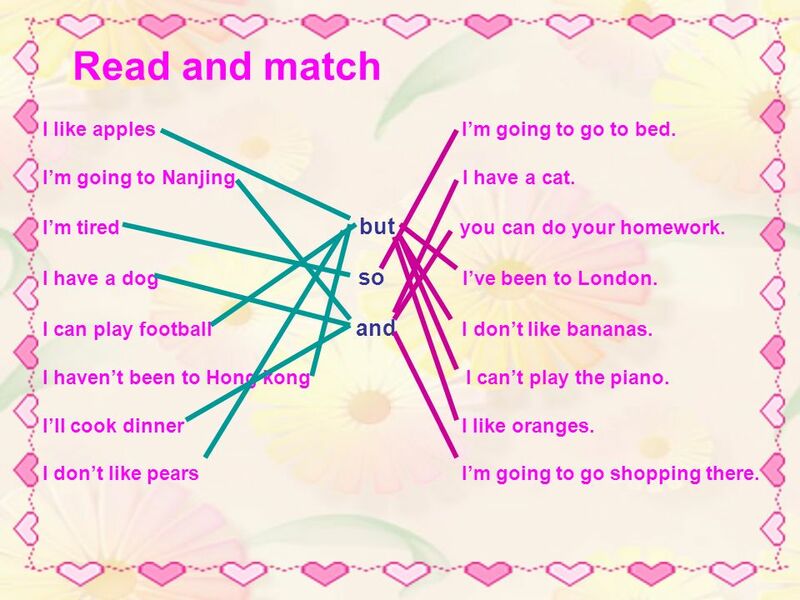 7 Read and match I like apples Im going to go to bed. Im going to Nanjing I have a cat. Im tired but you can do your homework. I have a dog so Ive been to London. I can play football and I dont like bananas. I havent been to Hong kong I cant play the piano. Ill cook dinner I like oranges. 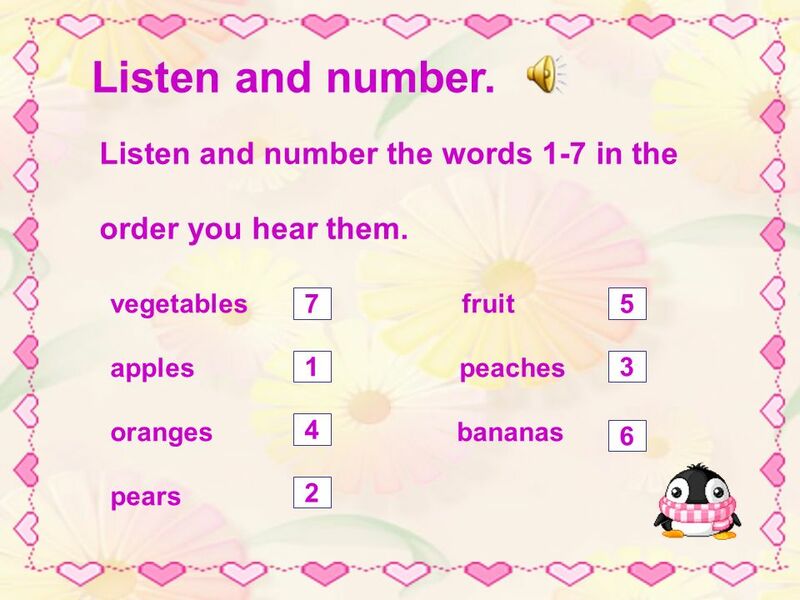 I dont like pears Im going to go shopping there. 8 Dialogue study 1.Who did Zhang Hai visit on his holiday? 2. Does his cousin live on a fruit farm? 3. What does his cousin grow? 4. Did he enjoy the hard work on the farm? 5. Did he eat a lot of healthy food? Why? He visited his cousin. Yes, he does. He grows not only fruit, but also vegetables. Yes, he did. Yes, because he loves fruit and vegetables. 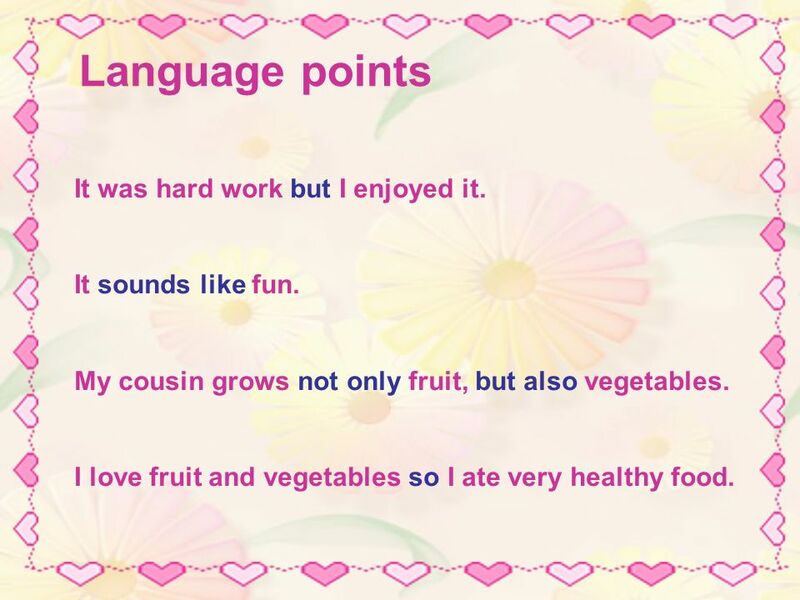 9 Language points It was hard work but I enjoyed it. It sounds like fun. My cousin grows not only fruit, but also vegetables. I love fruit and vegetables so I ate very healthy food. 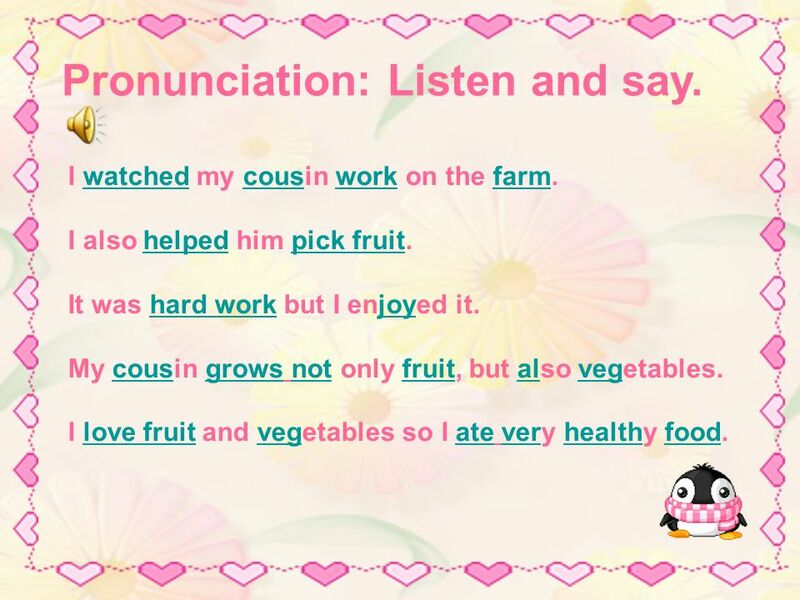 10 Pronunciation: Listen and say. I watched my cousin work on the farm. I also helped him pick fruit. 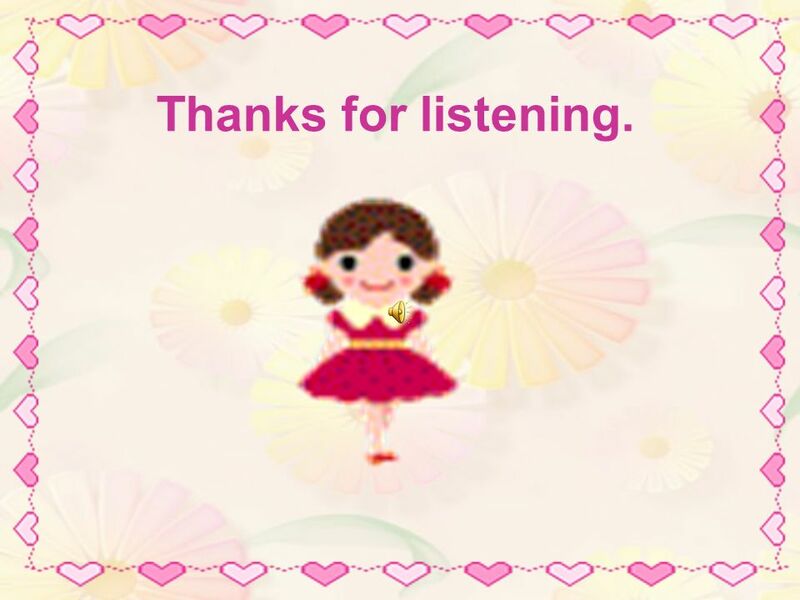 It was hard work but I enjoyed it. My cousin grows not only fruit, but also vegetables. I love fruit and vegetables so I ate very healthy food. 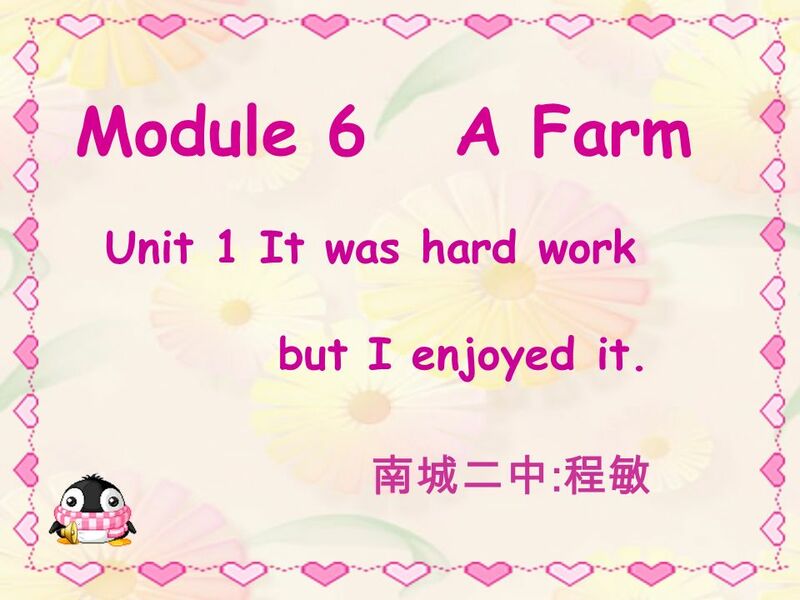 Download ppt "Module 6 A Farm Unit 1 It was hard work but I enjoyed it. :"
Go for it J8A. They went to Inner Mongolia on their last school trip. Did they see any…? Did they ride…? Module 4 Home alone I became so bored with their orders that I wished they would leave me alone. Unit 2. Module 3 1. What is your father going to do on Sunday? 2. What are you going to do at the weekend? Yum.... My favorite foods. Yum.... My favorite foods. Unit 3 Language in use Module 1 Unit 3 Language in use Module 1. Room 103 LINC 4 October 4 th,2013. IS WOULD YOU MAY DO ARE DOES.